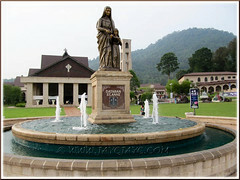 The Church of St. Anne in Bukit Mertajam, is Malaysia’s largest, most magnificent and spectacular Catholic church! This mammoth new church with attractive multi-tiered Minangkabau roofs, lovely Gothic architecture and spacious inside with a seating-capacity of 1,800, was built from year 2000 and dedicated on St Anne’s Feast Day, July 26 2002. An imposing and monumental structure to glorify and pay tribute to Our Heavenly King, The Almighty God who has blessed (and continues to bless) His people who visit this sanctuary, with countless miracles and healing through the powerful intercession of St Anne, the gracious mother of the Blessed Virgin Mary and grandmother of our Lord Jesus Christ. It was built to replace the old iconic church that could not cater to the ever increasing number of pilgrims and devotees. 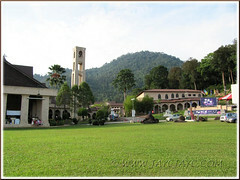 For several decades, St Anne’s sanctuary in Bukit Mertajam serves as the region’s center of pilgrimage and has drawn and still draws pilgrims by tens of thousands, local as well as from all over the world, especially for the annual St Anne’s 10-day feast celebration. For the last two years, the massive annual feast turnout was said to have been beyond 100,000! 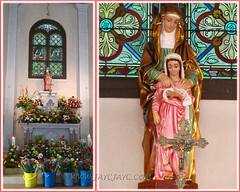 The actual feast day of Saints Anne and Joachim (the grandparents of Lord Jesus) is on July 26 every year but the Annual Feast of St Anne in Bukit Mertajam will be celebrated on the Sunday, on or immediately after July 26 and includes a 9-day novena preceding the Feast. 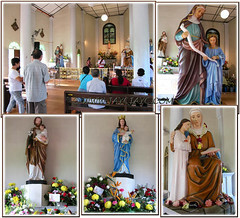 Thus, the 2011 St Anne’s Annual Novena and Feast Day Celebrations, themed ‘Discipleship through Family Life’ with the slogan ‘My Family, My Life’, began on July 22 and ended on July 31. My darling John and I felt blessed and joyful indeed, to have been able to make our second pilgrimage to St Anne’s Church recently (year 2010 was our first). We joined a busload of 44 pilgrims to St Anne’s Church, a tour organized by George Yeow. Hmm… more like a church marathon for 5 days/4 nights from July 25-29 that covered Ipoh, Bukit Mertajam, Penang, Kedah, Kelantan, Terengganu and Pahang. Truth be told, we’ve never before visited so many Catholic Churches, prayed so much at the churches, grottos and in the bus, as well as recited the rosaries and chaplet of Divine Mercy, plus sang numerous hymns, within five short successive days… haha! Whatever, all of us did enjoy ourselves tremendously as there was a good balance between prayer and fun times, thanks to our tour leader’s charismatic, creative and caring personality. Anyway, the focus of our pilgrimage tour was foremost to the Church of St Anne from July 25-26. These dates were chosen to enable us to attend the actual Feast Day of St. Anne and St. Joachim, on Tuesday the 26th. George felt it was best to avoid the massive turnout during the week-end, the climax of the 10-day Annual Feast Celebration which is touted as one of the world’s top 20 Catholic gatherings, like a mini Woodstock rock festival according to one of our friends who attended the feast celebration on Saturday night. We left Kuala Lumpur at 8.30 am, reached St. Michael’s Church in Ipoh about 1 pm and finally arrived at the Church of St. Anne in Bukit Mertajam at about 5 pm, somewhat behind schedule. Thus, we didn’t do the Stations of the Cross as planned but instead, spent about 1¼ hours (free&easy) to do our own private prayers, etc. at St Anne’s Church. 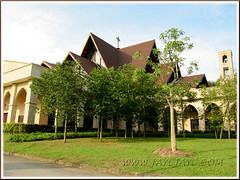 At 6.30 pm, we traveled to the Church of Christ The King in Sg. Petani, Kedah at the invitation of its Parish Priest, Fr. Nelson Joseph, for Mass (supposed to start at 7.30pm but delayed to 8pm as we were caught in the traffic jam) which was then followed by adoration prayers at its newly constructed and blessed Shrine of St Anne and dinner at the church’s compound. Then, traveled to Penang to check into Hotel Grand Continental, almost about midnight, for a 2-night stay. I was overwhelmed with a sense of peace and awe the moment I stepped into St. Anne’s sanctuary, with its sprawling 20-acre land of lush greenery that exudes tranquility and serenity. It’s truly a sight for sore eyes and undoubtedly you can feel the sacredness of the place. Didn’t Our Lord Jesus promised that when two or three are gathered in His name, He will be there in their midst (Matthew 18:20). And, indeed, there was a multitude of people, engaged in various activities, that was centered on God, Our Lord Jesus, Saints Anne & Joachim, and the Blessed Virgin Mary, for sure! This hallowed place of worship is a strong magnet to travelers, pilgrims and devotees alike, from near and far, of all race, culture, creed, ages and from all walks of life. There was much to explore and be awe-struck at the grandeur of this renowned center of pilgrimage! 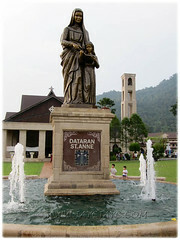 Clearly seen at the sanctuary is the new Church of St. Anne complex that comprises the new Minangkabau-Gothic-styed Church, the Parish Centre, Administrative Office, the Parish House, Dataran St. Anne and 15 life-size sculpturs of the Stations of the Cross around the church’s grounds. No less visible and standing tall is the famous Shrine of St Anne (the old church), St Anne’s Gift Shop, Museum, St Anne’s Water and Domus St. Anne, among others. During the short 1¼ hours available, John and I first targeted the old white-washed church that stands majestically above a flight of steps, a well-known iconic structure for more than a century. We desired very much to offer our praises and thanks for prayers answered and uplift petitions for ourselves, family members, relatives, friends and all peoples. This first historic St Anne church was built in 1888 by Fr. F.P. Sorin who amazingly died on St. Anne’s feast day, July 26 1907 and was buried in the main isle of this church that is now known as the Shrine of St Anne. This is where pilgrims and devotees converge annually in great numbers to pay homage to St. Anne with thankful and grateful hearts for countless prayers/petitions answered or make new prayer requests, offering lighted candles of various sizes, colourful flowers and bouquets. Undoubtedly, Blessed St. Anne, the patroness for miners, healing, housewives, childless couples, marriages and families, is a powerful intercessor, as attested by the massive crowd in attendance during the annual celebrations of her feastday. After worshiping at the Shrine, I explored the church’s grounds on my own (John was experiencing some leg pains due to his lumbar spondylosis) to capture life-size replica of the 15 stations. It’s wonderful that these new Stations were erected around the church’s compound to make it more accessible to pilgrims who are unable to follow the old Stations up the hilltop (behind the Shrine) due to ill-health. 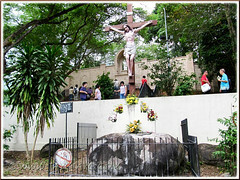 The Stations of the Cross is a spiritual devotion practiced by Catholics worldwide, meditating upon the main events along Jesus’ journey to His crucifixion. Traditionally, since the 16th century, there have been 14 Stations, from the moment when Pilate the Roman Governor condemned Jesus to death, His journey through the city of Jerusalem and to Calvary, and end with His burial in the tomb that same evening. A 15th Station was added to signify a glorious end as Jesus is risen from the dead at Easter, Alleluia – He is the resurrection and the life! Incidentally, I wish to take this opportunity to testify to Jesus’ saving power and the power of prayer. It happened at the 6th Station of the Cross where I was so engrossed at positioning myself to get the best angle for a perfect shot, moving forward, backward, left, right and back again, oblivious that I was standing on the metal frame covering the drain below. And, to my horror, when I did look down, I was already at the edge of the metal cover with my left foot raised above the uncovered part of the drain and would have toppled had I stepped down. I shuddered to think what would have happened had I not turned to my left and looked down at that crucial moment – what kind of head or limb injuries would I have sustained? I kept thanking Jesus, St. Anne and Mother Mary for saving me. For me, that was indeed a miracle! It was neither dramatic nor spectacular, but a miracle it certainly was and JESUS REALLY SAVES! Yes, I’m most grateful to have been saved in this manner rather than suffer severe injuries and pains resulting from a fall and be subsequently healed. I praise and thank God for such a wonderful experience of His saving grace. Nonetheless, when George asked us pilgrims to share about our experiences at St. Anne’s Church two days later, I kept mum and allowed my shyness to get the better of me. Also, allowed the devil to influence me to deem the wonderful miracle as trivial, a non-event! But Jesus insisted that I glorify Him because on the fifth morning of our pilgrimage tour, I was suddenly awakened at 3 am from my deep slumber by the whole miraculous event at the 6th Station of the Cross played before me over and over again for almost 2 hours. And, the Holy Spirit’s soft prompting that no miracle is too insignificant to mention or share. I knew then what was required of me. Thus, when homeward bound to Kuala Lumpur that same day, I finally shared about my blessed experience of God’s saving grace to the whole busload of pilgrims and thanked them too for praying for one another, for safety and protection from harm. I felt so very peaceful thereafter as if a load had been lifted off me. I strongly believe in the power of prayer, especially group prayer. I’m absolutely convinced that our prayers said together during the pilgrimage trip, repeated many times over, have been answered. WE’RE SAFE IN JESUS’ ARMS! 1833 – Catholics of mainly Chinese and Indian origin first settled at Batu Kawan and then moved to Permatang Tinggi, Macang Bubok and Bukit Mertajam. 1840 – The Chinese Catholics started settling down at the Bukit Mertajam foothill and were visited by the French missionaries who traveled from Batu Kawan. 1846 – This was the year the Parish of St Anne began with the building of the first chapel on the hill top by the first visiting priest, Fr. Adolphe Couellan, who named it after St Anne, a popular patron saint among the French missionaries. It was where the current 15th station of the Way of the Cross (the Crucifixion, just below the hill top St Anne’s statue) is sited, behind the Shrine of St Anne. The boulder which is the relic of the 1st chapel’s foundation still lies there. 1865 – Another bigger chapel was built by Fr. Maistre, the first visiting priest from Permatang Tinggi. 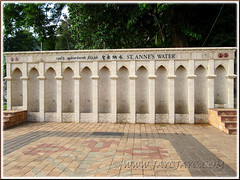 It was sited where its remains can still be seen today, just behind the well of St. Anne’s Water, where taps provide clear spring water, suitable for drinking. In 1869, Fr. Allard became the first resident priest. 1888 – The first church was built by Fr. F.P. Sorin. He died on 26 July, 1907 and was buried in the main aisle of the church. 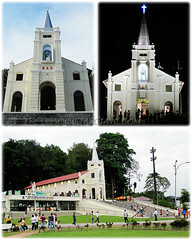 Since the dedication of the new church on 26 July 2002, this old St. Anne’s Church was converted and became known as the Shrine of St Anne, the main focus of St. Anne’s Feast annually. The stained glass set installed in 1896 by Fr. Charles Grenier behind the altar is still apparent today. 1938-1999 – Fr. Joachim Teng had bought the land in 1938 where the Kim Sen school and the second church are now located. In 1957, Fr. Thomas Chin built the second church, located next to Kim Sen School which has been called the new church for the last 45 years. 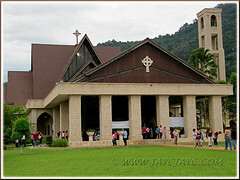 May 2000 – July 2002 – The building of the new church building complex that included the present Minangkabau-Gothic-styled Church of St Anne. Continue reading at Part 2 of the pilgrimage. Saving power of The Divine Mercy Image! I have the honour to design and install the new church sound and AV system under Fr Cheah. The speakers at the Bell Tower is the only one in this part of the region that is able to radiate sound 360deg at 2 km radius. Oh John Bosco… what a great honour to be able to do works of art/design for God’s church. Congrats and God bless you for your kind deeds.